anxiety, leading to his nervous breakdown. scared, but finding solace in one other. a father saving himself by saving his daughter. During a career spanning 25 years, Mark has worked as a management trainer. He has run learning programmes in innovation and creativity for corporate giants like Unilever, GlaxoSmithkline, Philips and HSBC right across the globe. Along with his business partner Hanne Kristiansen, he now runs a small agency called Creative Creatures. Throughout his life, Mark has struggled with pressure and anxiety, and suffered a nervous breakdown in 2001, brought on by work-related stress. During the last six years, Mark has utilised his experiences of mental ill health in his capacity as a carer, helping his daughter battle against anorexia nervosa. 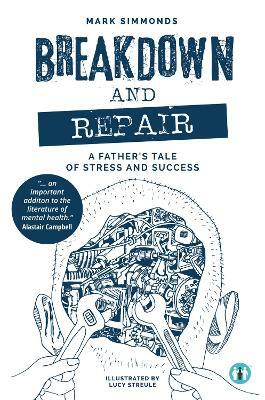 His book, Breakdown and Repair, brings both episodes to life very openly and honestly. By collaborating with the young and talented illustrator, Lucy Streule, his aim is to make the topic of mental health accessible to all by exploring the light side of darkness.